Why advertise on Accounting Basics for Students? The primary demographic for Accounting Basics for Students (ABFS) are students enrolled at school and college level as well as working professionals. This target audience is commonly looking for solutions to specific accounting problems on the net and is typically well-versed with computers, computer software and the internet in general. When describing ABFS, Alexa stated that “people who attended graduate school are greatly over-represented at the site." They additionally stated that the most common age bracket is 25-34. Visitors to ABFS come from all over the world. Around 50% of visitors are from the USA. This is followed by India (10%), Great Britain (5%), Australia and Canada at 4%, and the Philippines, Russian Federation and South Africa at 3% each. Top 20 countries also commonly include Pakistan, Malaysia, Japan, Singapore, the UAE, New Zealand and China. As you can see from the above screenshot, ABFS gets about 120,000 unique visitors per month and 300,000 monthly page views or hits(as at April 2015) which ensures your product will get a great deal of exposure. The site continues to grow at a tremendous rate. 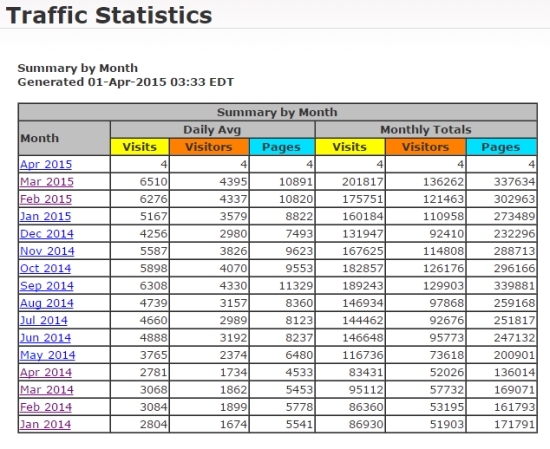 It has almost 5Xed over the last 4 years (used to get around 25,000 monthly visitors in June 2011). At least 20 individual web pages rank in the top 10 for Google searches for their respective keyword. For Bing searches the figure is even greater – 31 individual web pages rank in top 10 searches. Many web pages consistently get high traffic - over 5,000 page views per month each, with a few achieving above 10,000 monthly page views. Accounting Basics for Students is accepting a limited number of sponsorships on an exclusive basis. However, you must truly have an excellent product or service in order to be accepted. Accounting Basics for Students will not work with companies whose products or services are sub-par and/or not relevant to its visitors. You will be able to choose where and in what format your ad will appear on the site. We will work with you and create a tailor-made solution for your business so that the flow of customers to your business is maximized. Single high-traffic page only: Prominent advertising on ONE of the site’s top web pages - a page with 60,000+ page views per year - $500 per year. Sitewide advertising in right-hand column: Should receive around 3.5 million annual hits/views - $5,000 per year. Exclusive site sponsorship: Company logo included in site banner with phrase "Sponsored by" - 3.5 million annual hits/views (about 300,000 hits monthly) - $20,000 per year.